So as I mentioned, last month we threw a giant wrench into our normal eating habits. It was mostly for the sake of a good challenge, and I’m proud of what we came up with. 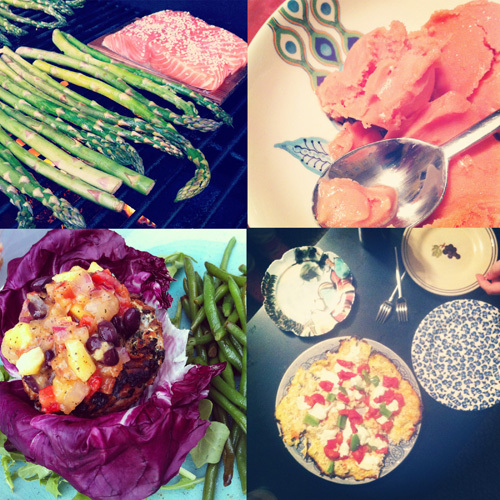 With the exception of a bit of weekend cheating we spent April without alcohol, meat, grains, or complex carbs. I’m pretty pleased. And while I seriously missed certain things (sushi), for the most part I was content and full. 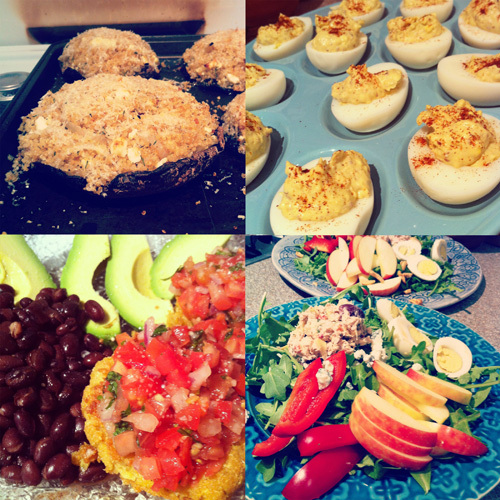 I know we’ll be incorporating a lot of these recipes into our regular diets. Most of the foods we experimented with last month have no place on this niche blog, but I thought I’d share a look at what we ate, for those that are curious. 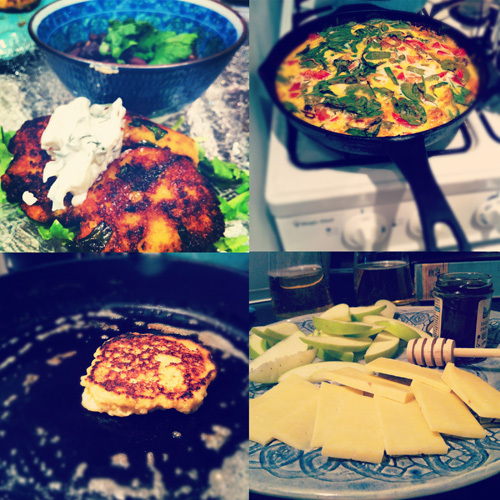 Top left: Cauliflower falafel; spring vegetable frittata; quinoa & ricotta pancakes; cheese plate with apples and honey. Recently a student at UNC contacted me for an article she was writing about the relationship between eating “Southern” and eating “well.” In my response to her I tried to make a lot of points about how we’ve gotten away from our roots in homesteading and gardening, how we’ve come to see once special occasion foods like fried chicken and pie as everyday foods, how portion sizes and ingredient ratios have spiraled out of control. But one point that I really wanted to emphasize is that more than any other trick or secret, moderation is what makes a difference. 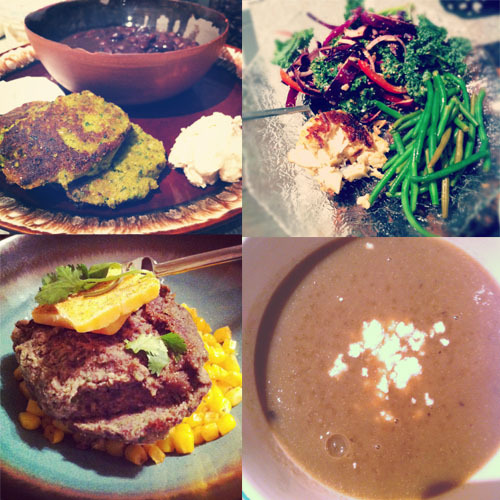 What I post on this blog, what you see of our meals, represents a very small portion of what we really eat. Believe me when I say I love a barbeque sandwich more than pretty much anything, but that’s not something I eat every day. What we eat most days is far more on par with what I’ve shown in this post, lean proteins, plenty of fresh fruit and vegetables, whole grains. And while I honestly enjoy eating this way and find a lot of “health” food to be delicious, what makes barbeque or pie or bacon cheeseburgers a treat is that I only eat them sometimes. I say this not to preach but to use my platform as a Southern food writer to emphasize reason and mindful eating. My dad said to me recently that it was my job to save Southern men’s lives by making my recipes lower in fat/calorie/cholesterol. And while I think I responded that Southerners (and a lot of Americans) would be healthier if they learned more about what they ate, where their food came from, and how to moderate their indulgences, I took to heart his message. I have an audience, I have a platform, and it is my responsibility to bring these conversations to the forefront. It isn’t lost on me that a boozy pie recipe is ten times as popular as something more healthy (or full of quinoa). And that’s totally fine. As long as we remember that a slice of whipped-cream laden pie is a treat. And that’s all for the soapbox today. I won’t be posting any more of these recipes than what I’ve already put up, but if you’d like a specific recipe let me know (in the comments or via email). Great nod towards Eating Southern vs. 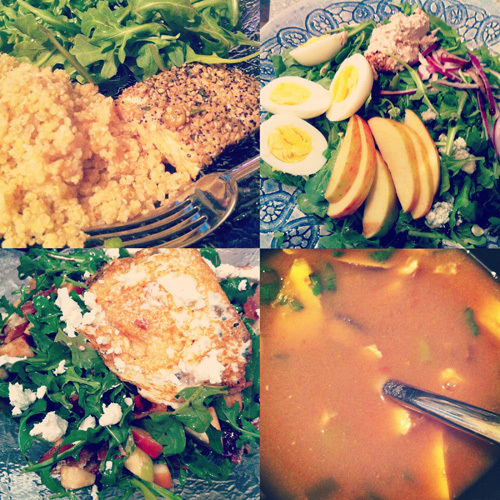 Eating Well! As a fellow Southern food writer, I get hit with much criticism for “supporting and furthering the foods of an obese society.” (Not my words.) But I also eat a balanced diet, I just don’t feel the need to blog about the steamed veggies I ate for lunch. I’m healthy, my fiance is healthy, and so is the rest of our family. I refuse to lose our wonderful food heritage [via recipes] to what society says is wrong. Cooking heirloom recipes from scratch is a wonderful gift, as is being Southern. Preach it, girl!! Thanks Nealey! I totally agree, I don’t feel like I need to post about everything I eat, this isn’t a daily lifestyle blog. And our grandparents and great grandparents weren’t obese because they weren’t eating these high-fat foods for every meal, and their portion sizes were in control. We’ve lost our sense of context for Southern foods, and I really believe that we need to think more about moderation and less about rejecting these foods from our diets. Fry on!